Our trip to the community of El Chaparral in northern Nicaragua was a very rewarding experience. We had an excellent team of dedicated volunteers whose hard work, commitment and support contributed to the success of the mission trip. 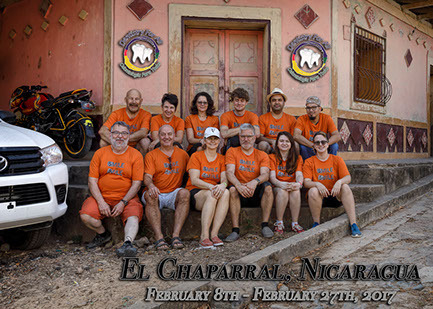 The organizing committee in El Chaparral welcomed us into their community and took excellent care of us during our visit. The communities that we served were very appreciative for the treatment that we provided. We changed a lot of smiles! There are always unexpected challenges that occur when organizing a mission trip. We were informed last minute that our interpreter was no longer available. Friends and family of Oscar, our interpreter from last year, stepped up to assist us. It was a wonderful experience and great to make new connections with Victor, Alex and Hernan. Blaine Aucoin, Julian Buchwald and Dennis McLaughlin arrived in Nicaragua on February 8th, 2017. Unfortunately, our paperwork had not arrived but they were able to get into the country without too much difficulty. They headed off to Achuapa the next day to load our equipment for transport. They discovered that some of our bins had water damage and critters! We lost some of our supplies but it was not anything critical. We had already planned to store our equipment in Managua next year where conditions are much better. The first team set up the clinic in El Chaparral and then travelled to Las Pilas to plan next years trip. They returned to Managua to meet the rest of the team. The second group of Greg and Val Jansen, Karen McLaughlin, Michelle Buchwald, Curtis Aucoin and Trudy Aucoin, arrived on Friday, February 10th, 2017. The trip to Nicaragua was uneventful and all of the luggage arrived safely. Bev and Dennis Bedard also welcomed us at the airport. They had just completed a two-week mission in Managua at the new clinic. The next day we toured the new facility and the hotel that their volunteers stayed at. It is a very impressive operation. On Sunday, the team travelled to El Chaparral to set up the clinic and sleeping quarters. The community was very excited about hosting us. The facilities were functional and comfortable. We were pleasantly surprised by a new baño outside the community hall for our use. The first sleep in the village was challenging due to the temperature and the sounds of nature. We survived and awoke excited to open the clinic for patients. Our first day was interesting. An official with Minsa came to our clinic and wanted to be treated even though she was not on the list. We did accommodate her but we were concerned about her request. Later that day, two other officials presented and wanted to see how the clinic was operating. They checked our medications, anesthetic and sundries for expiry dates. They also compared the information on our documentation to what was in the clinic. The process was very disruptive because we were trying to provide care to patients. Despite this inconvenience, the team worked very hard and we were very productive. The next day a dentist from the region came and observed us for half a day. She indicated that she was directed to be present at the clinic every day we were operating. It is good to connect with local caregivers but it was intimidating. Luis Enrique and a representative from FUNDACCO visited our clinic on Wednesday. They went to see the representative from Minsa. They were able to address their concerns and resolve the situation. We were given permission to continue operating our clinic without supervision. We headed to Leon for a weekend of rest and relaxation. The two students from the University of Alberta, Lindsey Boehme and Adityender Seth and our second-week interpreter Hernan met us there. Part of the team experienced tobogganing on a volcano and the rest of us headed to the beach for sun and surfing. It was a great weekend experiencing the beautiful city of Leon. The second week in the village went very well. We are very proud that the team was able to see 289 patients and provide over 1000 procedures during the two-week mission. The majority of the treatment was restorative. We donated supplies to the local health authority in Santo Tomas del Norte and to Minsa in order to assist with continuity of dental care. The community embraced us and invited us into their lives. They hosted a very special celebration and presented us each with a gift of appreciation. They touched our hearts with their hugs and smiles. The community was concerned that we would not return due to the inconveniences that we had experienced. We reassured them that we would be back to El Chaparral. On the weekend prior to our departure, we were fortunate to experience more of Nicaragua. We toured around Chinendega, visited the Malacon in Managua and enjoyed the beach in San Juan del Sur. Nicaragua is a beautiful country and we are looking forward to returning next year!